If any one spots any mentions of The Radar Station in the press, please do let me know. 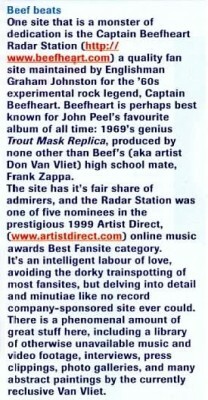 This small piece appeared in the September 1998 issue of The Wire, in their best bits of the Internet section. 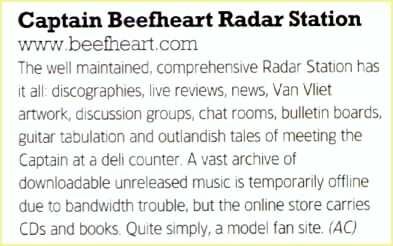 Despite the mistake with the Radar Station’s name this was a fantastic plug. 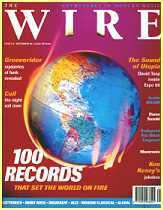 Visit The Wire on the web. The October 1999 issue of Mojo contained a small feature about paintings by musicians on the Internet, part of which is reproduced below. 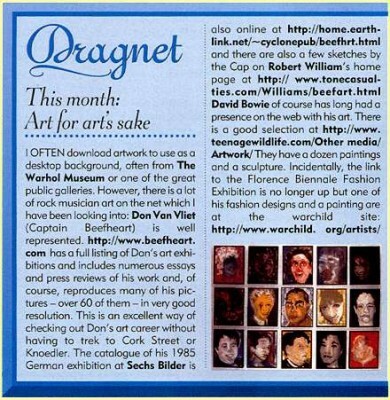 The first artist mentioned was none other than Don Van Vliet (naturally). 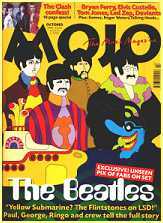 Visit Mojo on the web. Sadly the site didn’t win which would have given me an all expenses paid trip to LA to the awards ceremony, nevertheless I am thrilled with this recognition. 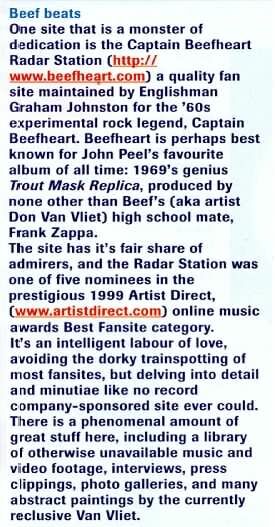 It still confuses me how the Radar Station ended up in the running in the first place – it was up against sites for the likes of Pearl Jam, Metallica and Rob Zombie, and the awards largely focus on the corporate big-knobs, not Captain Beefheart. One Radar Station visitor said it reminded her of the Sesame Street sequence – ‘which of these things is not like the others…’. Sincere thanks to everyone who voted and sent along good wishes – cheers. 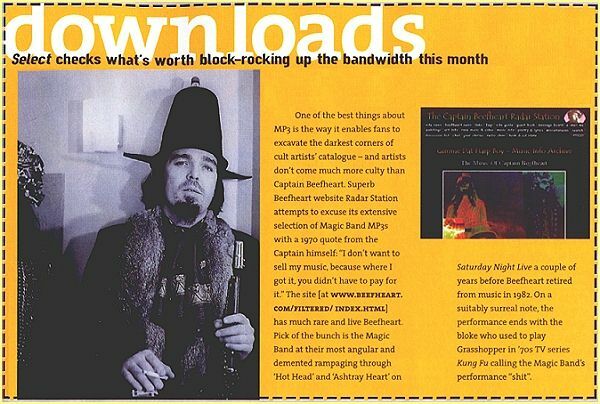 The May 2000 issue of Select magazine featured this small piece about the downloads available at the Radar Station which will hopefully lead to a few indie kids discovering the joys of Bat Chain Puller and realising that Beefheart could have kicked Slipknot’s collective arses any day. 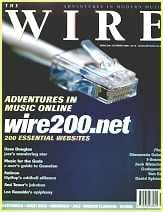 This small piece appeared in the July-August 2000 issue of the New Zealand Hi-fi magazine, Tone, in their guide to the Internet section. Many thanks to Tom Rodwell for both writing this piece and for sending the magazine along.